An idea leads to a concept which leads to a design which leads to a physical reality… or not. Some of the most interesting and creative architectural design ideas are never implemented because they are not feasible with currently available technology or they are not economically practical. 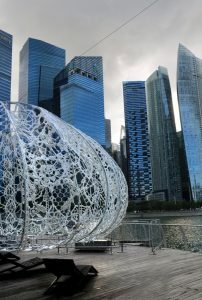 But we’d like to focus on one of the most creative ornamental metals projects we’ve ever seen and which we helped to make real for the iLight Marina Bay 2017 light festival, Singapore. Modern Metal Solutions had the privilege of working with Choi + Shine Architects to provide engineering support and metal fabrication services required to build the first-of-their-kind “Urchins” – model sea urchin shells that “float” at about chest or shoulder height over public docks serving a section of Marina Bay, Singapore. 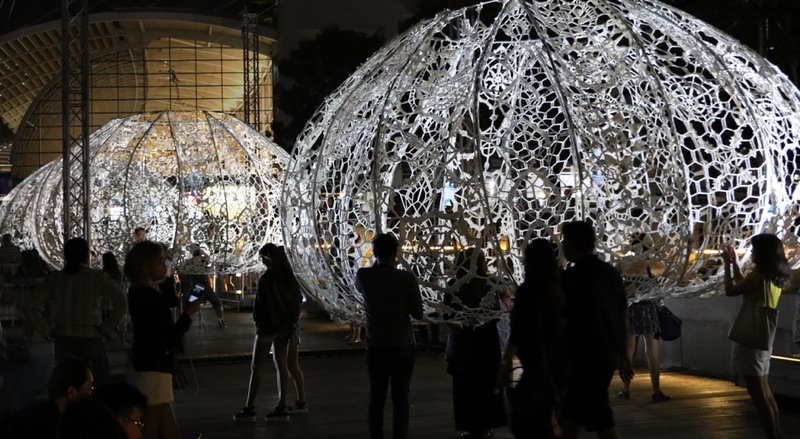 Featured on their website, Choi + Shine succinctly describes how the idea and implementation of this project unfolded: “The Urchins were created in response to a call for art for the 2017 iLight Marina Bay, Singapore, a festival with Biomimicry and Sustainability as themes. “This project is inspired by sea urchin shells, which are enclosed yet light weight, delicate and open. Their textured and permeable surface interacting with light creates openness, while the pattern’s mathematical repetition brings visual rhythm and harmony. Against light, the sea urchin’s natural form reveals one of the most spectacular patterns found in nature. The highly detailed and symmetric outer fabric patterns play beautifully in daylight and take on a wonderful reflective glow at night. It was meticulously hand crocheted by over 50 people applying their skills and labor. Modern Metal Solutions was heavily involved in the fabrication of the supporting structure which took about two and a half months to plan, detail and build. We developed the connections and center post systems to be collapsible for ease of shipping, and fabricated the frame assembly in a few days. The metal structure for the three Urchins shipped on a standard 36” pallet and was assembled in Singapore in a matter of hours into three 15 ft. X 10 ft. Urchins. It was a pleasure working with the visionary team at Choi + Shine to help them make this big-as-life art project a reality that thousands of people have enjoyed in one of the world’s great cities! Whether it’s reflecting the beauty of the world’s natural wonders or simply designing more elegant and visually attractive structures, architects have the unique opportunity to shape our built environment. Helping them turn their most creative ideas into reality is a rewarding aspect of our work.